It is with great sadness that we bring this news. The County Parks Deptartment has informed us that the parks will remain closed indefinitely. There is no electrical power on the Cathedral Pines property at this time and it is not an immediate priority to correct that. We are left with no choice but to cancel the race for 2012. Please understand that we tried to secure a postponement date to no avail. We are as disappointed as you all are. This is our chance, as racers, to be on the other side and spectate. We are working on reimbursements from our vendors as this is written. We appreciate your patience with us these past couple weeks. We are working on refunds. Stay tuned! Do not despair! The park WILL reopen at some point. 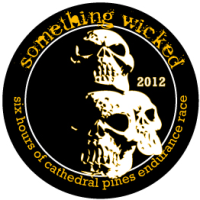 There WILL be a SOMETHING WICKED 6 Hour Race in 2013. 57 spots remaining! Get in now or miss out on your wildest dreams! Walk ups on race day are for Pros (with valid licenses only)! We are gearing up to, once again, torture you all on Saturday November 17th 2012. You are hereby summoned to attend the fourth cycle of Something Wicked. Don't make us come looking for you. Registration will open on Bikereg on May 1st at high noon. There will be a link to Bikereg at www.somethingwickedevents.com. We are capping the race at 300 again and it will be pre-registration only. NO TRANSFERS / NO WAITLISTS!!! New this year will be a 12-18 category. Go in peace, obey the bunny. ...the harbingers of horror are at it again. We are anxiously awaiting you at another sufferfest, this November 17th.